John Brown’s exploits at Harpers Ferry, West Virginia in October of 1859, and his subsequent hanging in Charlestown, are well known. Less well known is the time he spent in Washington County, Maryland, earlier in 1859. The Washington House, on West Washington Street in Hagerstown was a bustling enterprise. 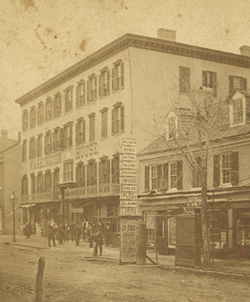 On June 30th, 1859 the hotel had at least 25 guests, including I. Smith and Sons, Oliver Smith and Owen Smith and Jeremiah Anderson, all from New York. After the Washington House was destroyed by fire in 1879, the Baldwin House was built on the site and it is this building that presently houses the University System of Maryland at Hagerstown. From papers found in the Kennedy Farmhouse after the raid, it is known that Brown wrote that he would sign into a hotel as I. Smith and Sons. It is believed that Brown, his sons Owen and Oliver and Jeremiah Anderson, on their way from Chambersburg PA to the Kennedy Farmhouse in south Washington County, stayed in the Washington House in Hagerstown, the Browns using the alias of Smith. The Register from the Washington House was found in the Washington County Court House among court documents and was given to the Western Maryland Room by Clerk of the Court Vaughn Baker. As a result, the library now has the book containing the entry for "I. Smith", John Brown's alias, which is included on this website. phrenzied, malignant out-laws, roused by no provocation ... and a few others of the gang were seen here, in Hagerstown, frequently during the last summer; and the former actually boarded at one of our respectable hotels. Also on this page are the letter from Brown to one of his group, Kagi, explaining how he would use the pseudonym I. Smith, two articles from the Hagerstown newspapers of 1859, and a carte de visite of Brown. Western Maryland Regional Library is grateful to Jean Libby for making available the carte de visite of John Brown and the letter to John Henrie Kagi, and to the Newspaper Indexing Project of the Washington County Free Library.